And so you live in a tightly sealed house? Well, you must miss fresh air then and I'm sure you do because there's no alternative to fresh air and an unventilated home gives a really odd feel too. Most of the buildings in the GTA are treated with home insulation. When a home is insulated in whatever way, it is made more tightly sealed for the heat to remain trapped. But when that happens, the natural ventilation process is also affected thus not allowing enough fresh air to enter the home. The Heat Recovery Ventilation or HRV is a wonderful method that makes the flow of fresh air into the home possible. Moreover, when the inside warm air moves outside through duct, the heat exchanger extracts the heat. It then uses that heat to warm the incoming fresh cool air. This way the inside of a home gets fresh and warm air thus fulfilling the need of fresh air while also treating its temperature. 1. They trap heat from the outgoing air up to 80% saving a lot of energy. 2. They warm the incoming cool air and provide a moderately fresh air for home. 3. 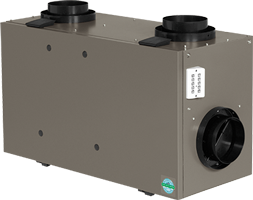 Heat recovery ventilators also use filters to traps the pollutants. 4. HRV is energy efficient as the indoor air remains fresh and warm, there's relatively less need to use home comfort appliances.